red and glistening with rain. over cups of weak coffee. She’s long dead like Shakespeare. 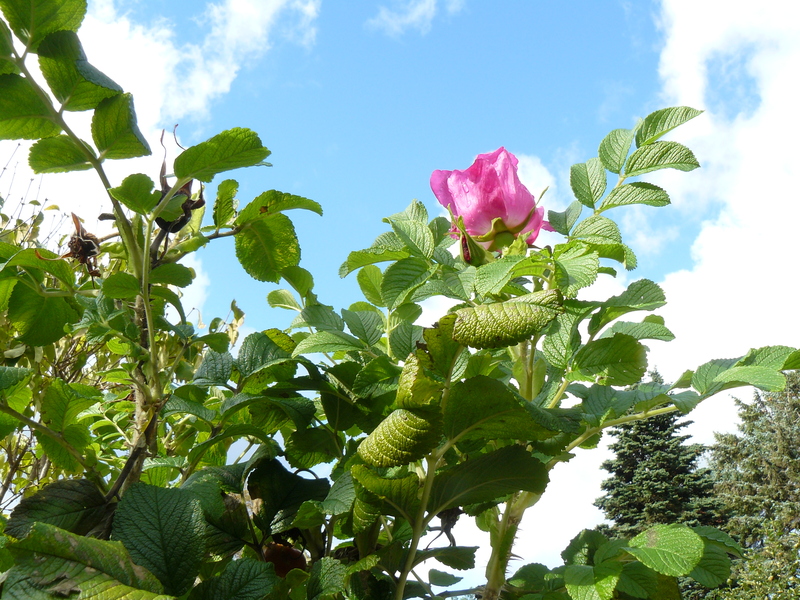 just for writing about a late blooming rose. 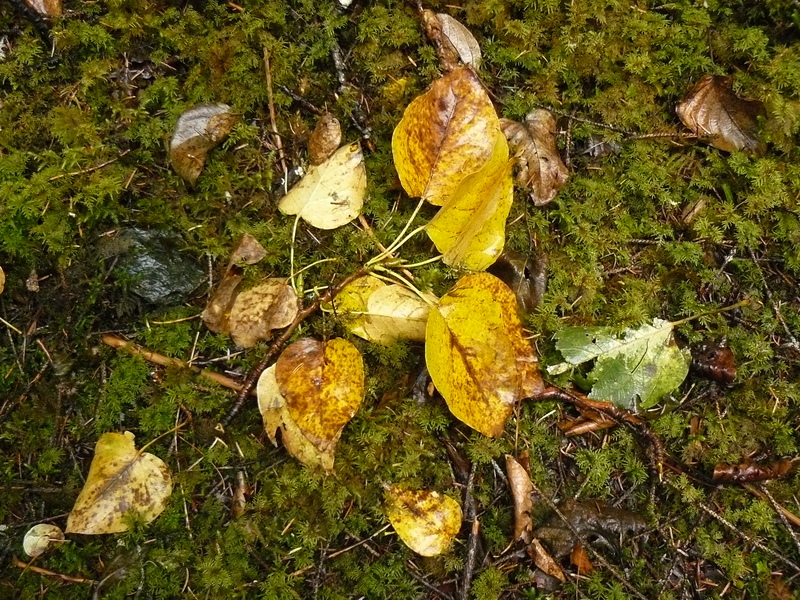 This entry was posted in Dan Branch, Juneau, Kwethluk, Nature, Poetry, Southeast Alaska on September 30, 2011 by Dan Branch. The troll wood has tarted herself up on this windy wet morning. She needn’t bother. I’ve grown to love her without judgment even in November when wind and darkness reduce her to a bare study in earth tones. Still, I appreciate the effort and effect of her yellowing cottonwood leaves against evergreen hills. As Aki plays hide and seek with a very brave sparrow, I inspect the colorful leaves the woods uses for makeup. From a distance they blend in beauty but close up they are dying and insect bitten and mottled—-A woman’s foundation applied too thickly over tired skin. Pulling back I find the tree still a yellow candle flame flickering in a strengthening wind. Believing that the storm promised in this morning’s marine weather alert has arrived we move deeper into the woods that still sport a thick enough canopy to block some of the rain. Our trail leads to edge of a pocket lake. On clear days we can look across it at the glacier and surrounding mountains. Today’s rain veils all the glory so my eyes drop to the lake’s surface and count the different shades of lights and darks in the swells. Aki, who could probably benefit from a set of eyeglasses, uses her nose to follow the trail of different creatures that occupy the woods at night. When she suddenly runs an erratic pattern over the mossy forest floor I look up expect to see the target of her attention standing nearby. Aki might be tracing a beaver’s path. We pass their wood covered house with its entrance submerged a feet few below the lake’s surface. We also pass a foot thick cottonwood tree they fell in years past. The beavers chewed the tree’s base until a only a inch or two of wood remained at the tree’s core, inflicting an hourglass shaped wound. The wind did the rest, snapping off the tree at its reduced base while the beavers are safely at home. Deep in the woods we find a single cranberry shoot. It’s few leaves offer the only red in a forest dominated by yellows, greens and grays. This is a jewell, its beauty enhanced by closer inspection. How did it end up here a slender representative of its kind in this moss dominated forest? A gardening troll? 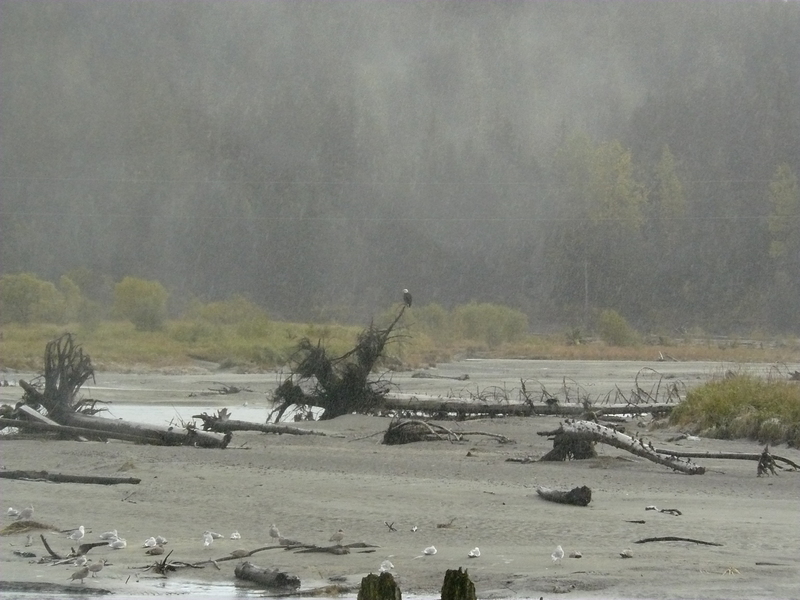 This entry was posted in Aki, Dan Branch, Juneau, Kwethluk, Nature, Southeast Alaska on September 28, 2011 by Dan Branch. After watching the morning sun burn off the channel fog, I grab Aki and her accouterments and head for the alpine. It will be cold there now. Even on Chicken Ridge the sun provides little relief from the fall chill. I pick the trail for it’s sunny aspect and the opportunity to enjoy a different kind of fall color. The high odds that we will not see a bear also factored in because of yesterday’s foolishly brave display by Aki. The earth’s western roll is just releasing the sun when we reach the trail head. Its rays are quickly melting last night’s frost on the muskeg and sparkling bags of frost water hang from grass and berry brush. Last night’s hard freeze stiffened the moist muskeg but it quickly gives way to my booted steps. We find flowers in full bloom here. One white daisy, undeterred by last night’s rough treatment, arcs toward the rising sun. The trail winds across ski bowls, flattens a bit then climbs steadily to the mountain ridge that offers views of Stephens Passage and Admiralty Island. Early birds, we have the place to ourselves until two returning deer hunters pass us on the saddle. Their face reflects the peace that comes to those who hunt deer on foot—forced to move slowly— watch carefully—recognize what is out of place. I miss that feeling. Halfway up the mountain we stop to watch the ground drop onto the other side of the island. In a hundred places thin strips of spider silk stretched between stunted trees sparkle in the early morning light. On the horizon, where the old growth spruce forest starts, I see what appears to be a flock of tiny white birds then realize they are only the highlights of sun on spider silk moving in a gentle breeze. 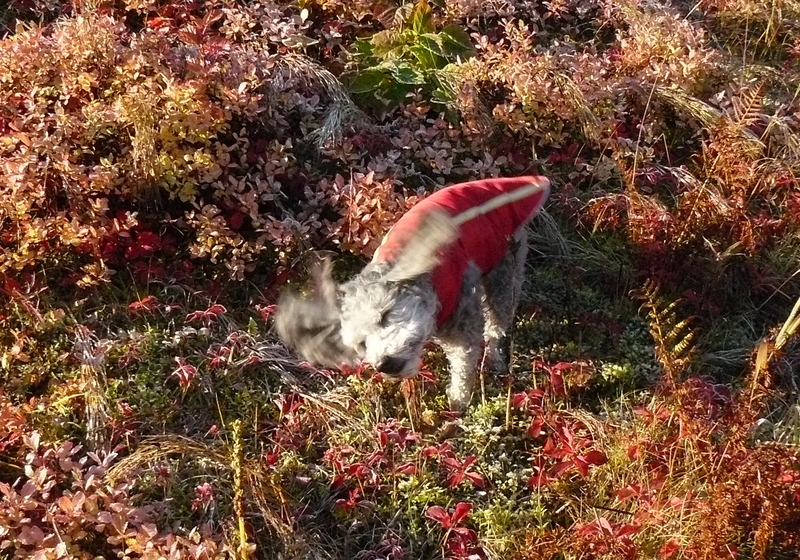 Leaving the trail we head off across the tundra like muskeg to appreciate the tiny world of low growing berries and miniature grasses now glowing with fall color. 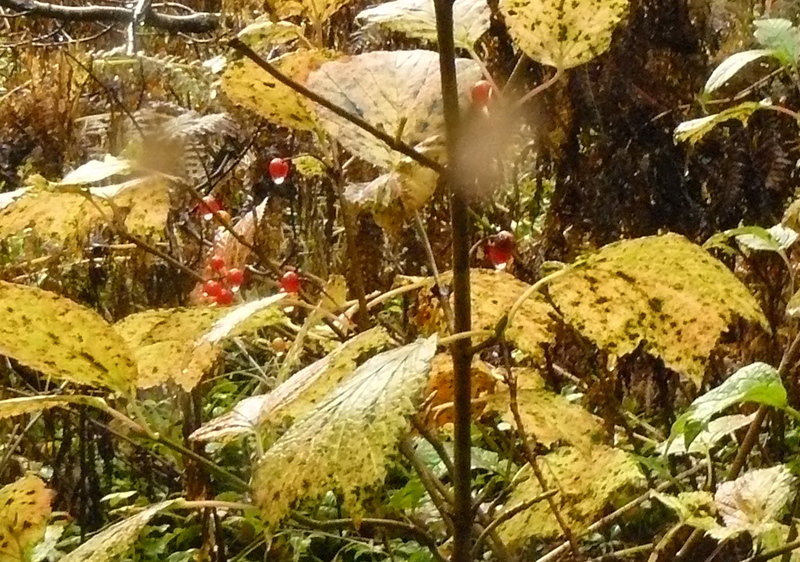 In low pockets frost still dulls the garish reds of berry leaves. They lose their beauty after the sun melts its away. A simple bunch grass, only six inches tall is the true star this morning. Still a deep living green at its base, each stalk of this grass changes to a startling yellow then gold then dead brown at the tip. Nicely spaced on a slope the clumps provide little sheltered spaces for neighboring berries and moss. 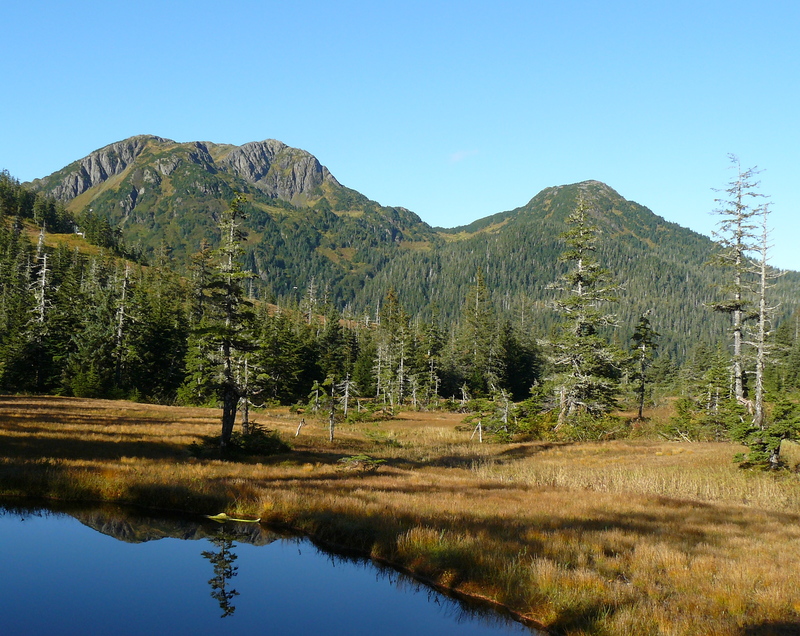 This entry was posted in Aki, Dan Branch, Juneau, Kwethluk, Nature, Southeast Alaska on September 25, 2011 by Dan Branch. Aki and I spent last week in different universes. She stayed with her friend Zoe out the road while I traveled to Anchorage and the Lower 48. Both of us longing for trail time, we hop into the car and head for a trail that usually offers fall color but no bears this time of year. Near the trail head yellowing cottonwoods line the road and peaks, each a miniature Matterhorn, wear a fresh dusting of snow. Unexpected horse dung splatters the first portion of the trail but we push on anyway, drawn on by the fading yellow of dying devil’s club leaves and the promise of deep reds and oranges further on. The devil’s clubs have already moved much of their life force to root, leaving rich yellow leaves to brown and fold and drop to ground already covered by browned out ferns. We pass a patch of small plants growing close to the ground, their perfectly formed leaves gone from green to ghost white. Here we start to see horse tracks cutting up the soft trail. The wounds of this domestic are as unwelcome as those of an invader so I take a path less traveled when it forks away the main trail. Aki holds back, puzzled by my choice but soon takes up station just behind my heels. The fall colors are stronger here, the decay less advanced. The sun breaks through when we reach a small wooded creek crossing bridge, gifting us with northern light on freshly washed land. Aki breaks barking from behind while I try to photograph the beauty. Drawn by a crash and the ferociousness of her voice I run and find she has treed a black bear. Calling out I distract her long enough to allow the bear a chance to break for the woods. She follows for a few feet and returns ready to accept admonition. I start lecturing her, parent style — he could had swept you into the river with a backhanded blow — crushed your 9 pound body with teeth or paw. She looks up confused and a little hurt like she is being wrongly chastised for protecting me from an obvious danger. In the end I sentence her to loss of liberty at the end of the leash and start casting about for bear free trails. 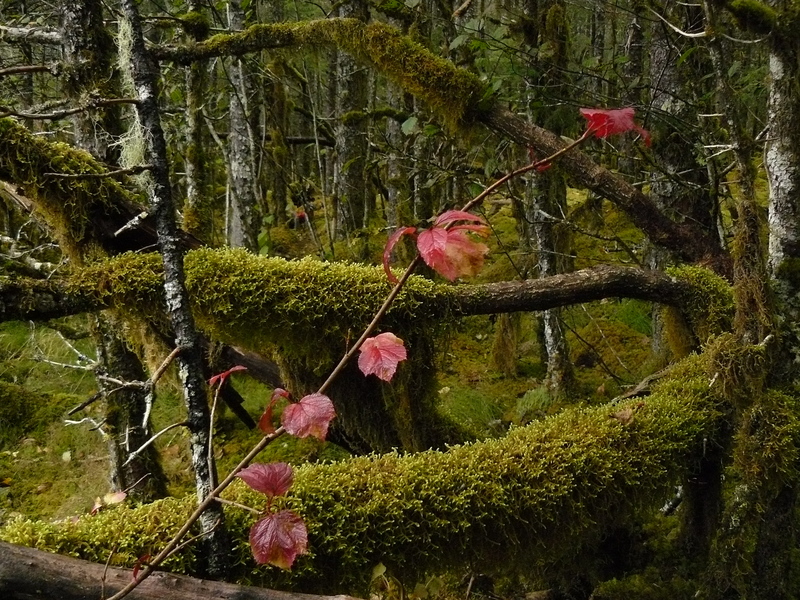 Returning to the main trail where we seldom see bear sign, we find deep reds patches of ground hugging berry plants and bloody leaves on free formed high bush cranberries. On a tidal meadow yellowing grass provides all the color needed to contrast the grey brown river and balance the yellowing cotton wood trees on the other side. The rain still falls as it has done from the start, undaunted by the shafts of sunlight that occasionally power through the cloud cover. By now rain drops spot the camera lens, making themselves a prominent part of each picture —-enhancing the story of how Aki treed the bear as the sun shone and the rain fell and I yelled out my fear. 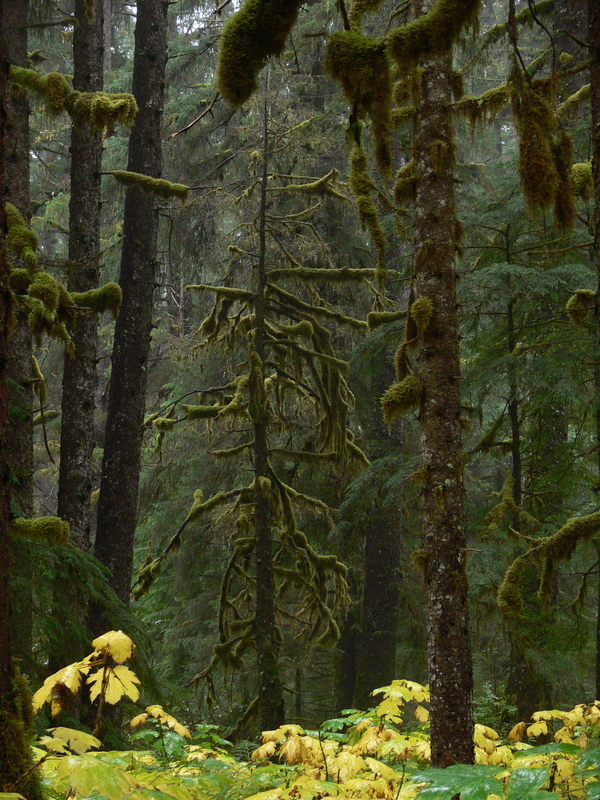 This entry was posted in Aki, Dan Branch, Juneau, Kwethluk, Nature, Southeast Alaska on September 24, 2011 by Dan Branch. and cleanse away summer’s buildup of decay. but the promise of a rich spring. into a stiff northern wind. 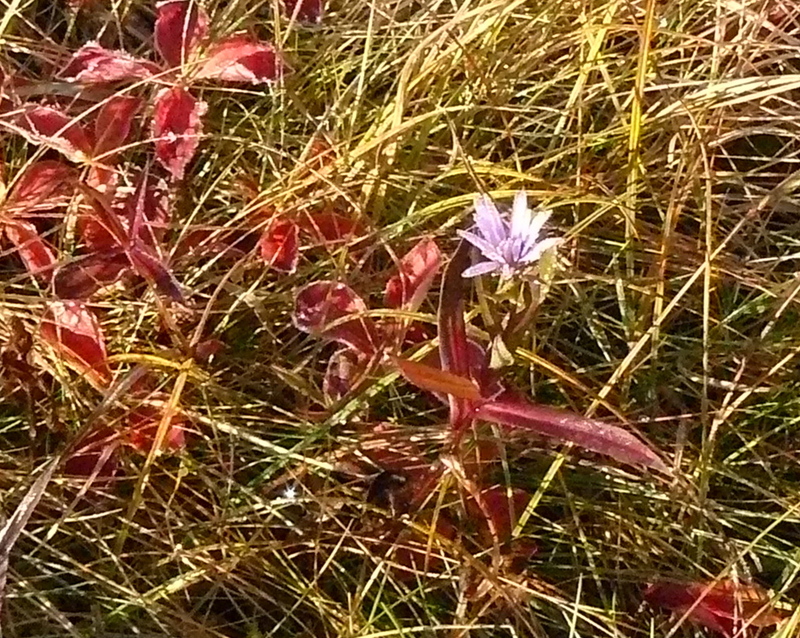 This entry was posted in Dan Branch, Juneau, Kwethluk, Nature, Poetry, Southeast Alaska on September 21, 2011 by Dan Branch. Rain pours down as we pass a sign warning us we are in bear country. Almost all the Juneau trail heads sport one. The City should post one on Chicken Ridge where we nearly ran into a big male black bear during last night’s dog constitutional. Aki barked and the bear stopped moving toward us. Now fifty feet away it slowly reversed course and ambled past our neighbor’s house and out of sight. Today, expecting all respectable bears to be haunting the salmon spawning grounds we move into the old growth forest. Devil’s club in fall color line the trail. In some place they occupy the ground all the way to the river. The migration of nutrients from leaf to root has weakened the big ragged edged leaves so they now curve down in the rain. Plants with circles of five or six leaves form umbrellas for the cranberry brush below. A painter replacing the yellows and greens with somber colors could transform the scene into a parity of the famous Renoir painting. Here and there single stocks of devil’s clubs have pushed their circle of leaves high above the crowd below, like polite gentlemen making way for a diminutive woman to pass. Deeper into the woods the smell of death hangs over the trail. 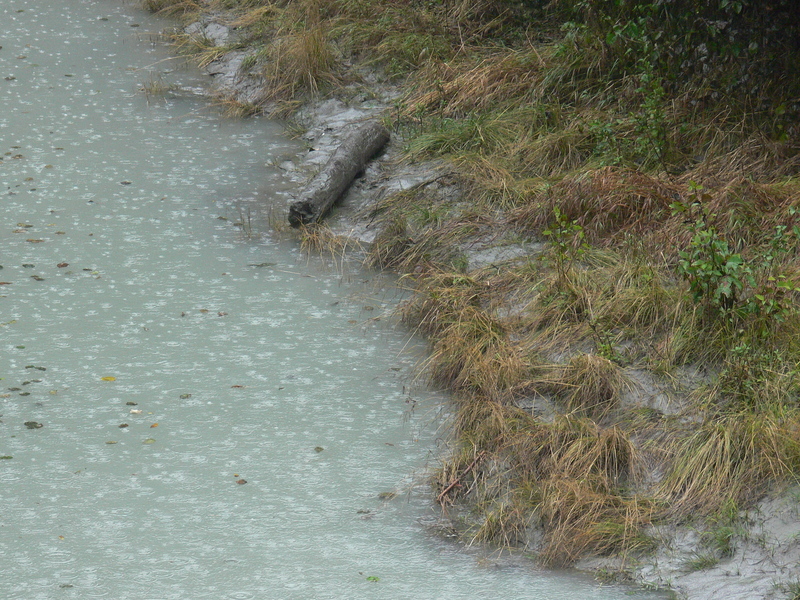 Silver salmon, now rotten beyond use for anything but fertilizer lay along a forest depression that only holds water during times of storm. I ask Aki, “What diverted these fish from the truth path to their birth waters to this sad end?” Looking like a dog out of patience for such foolishness, she trots back into the woods. 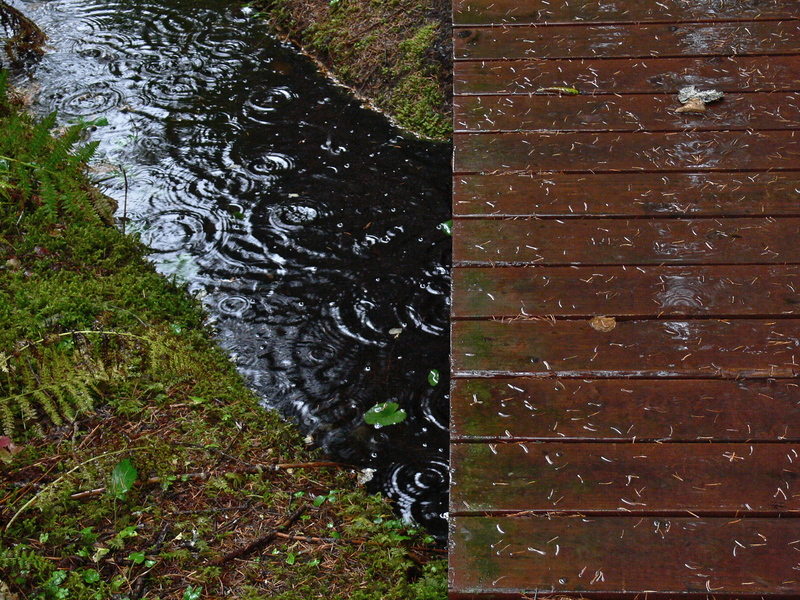 This entry was posted in Aki, Dan Branch, Juneau, Kwethluk, Nature, Southeast Alaska on September 14, 2011 by Dan Branch. 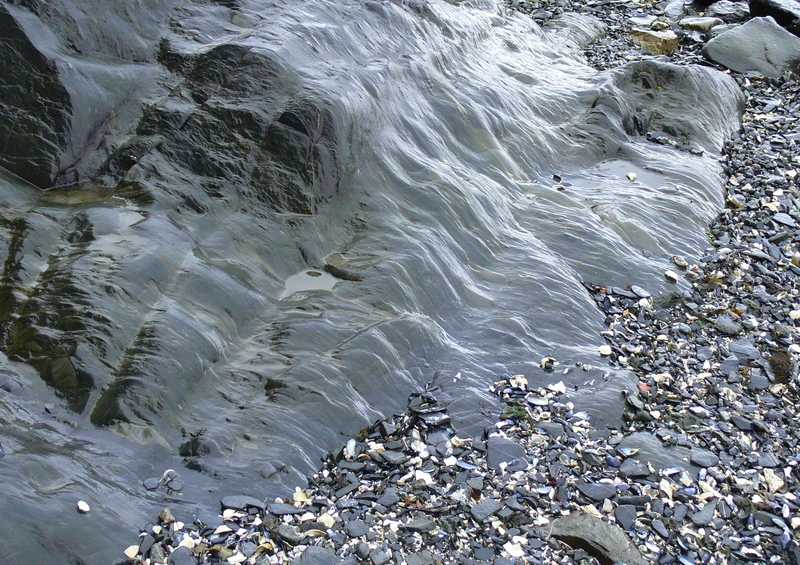 This entry was posted in Dan Branch, Juneau, Kwethluk, Nature, Poetry, Southeast Alaska on September 14, 2011 by Dan Branch.